Late 19th-century Americans loved railroads, which seemed to eradicate time and space, moving goods and people more cheaply and more conveniently than ever before. And they feared railroads because in most of the country it was impossible to do business without them. Businesses, and the republic itself, seemed to be at the mercy of the monopoly power of railroad corporations. American farmers, businessmen and consumers thought of competition as a way to ensure fairness in the marketplace. But with no real competitors over many routes, railroads could charge different rates to different customers. This power to decide economic winners and losers threatened not only individual businesses but also the conditions that sustained the republic. However, no proposed regulations for an open internet address the existing power of either the service providers or the “Big Five” internet giants: Apple, Amazon, Facebook, Google and Microsoft. Like Standard Oil, they have the power to wring enormous advantages from the internet service providers, to the detriment of smaller competitors. The most important element of the debate – both then and now – is not the particular regulations that are or are not enacted. What’s crucial is the wider concerns about the effects on society. 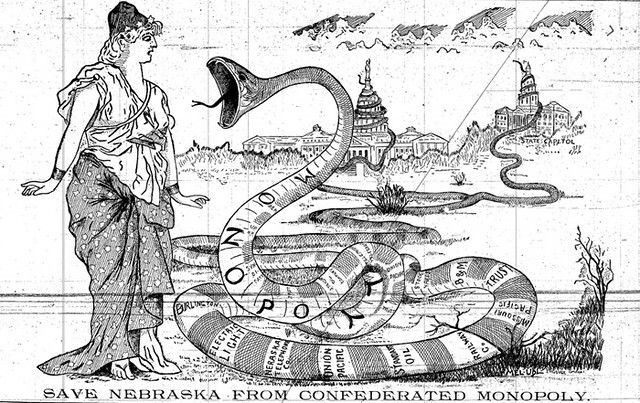 The Gilded Age’s anti-monopolists had political and moral concerns, not economic ones. They believed, as many in the U.S. still do, that a democracy’s economy should be judged not only – nor even primarily – by its financial output. Rather, success is how well it sustains the ideals, values and engaged citizenship on which free societies depend. When monopoly threatens something as fundamental as the free circulation of information and the equal access of citizens to technologies central to their daily life, the issues are no longer economic. From it’s earliest days, it also functioned as a bank, factoring the shipments of gold that it carried. Indeed, when Wells, Fargo exited the freight business as a result of government nationalization of freight during World War I, the bank (which merged with Nevada National in the first of a series of “transformative transactions”) continued to operate as “Wells, Fargo,” as indeed it does (albeit under unrecognizably evolved ownership) today.